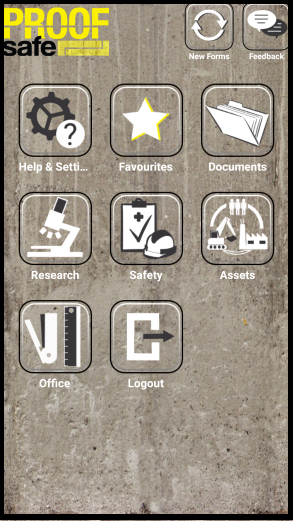 Digitise all your paper systems - ProofSafe is a web based software package and an App for phones and tablets. We enable organisations to easily collect and manage information. ProofSafe is flexible and tailored to suit your team. ProofSafe is simple for the whole team to use and customised to suit your organisation. Create and edit any form you need, share those digital forms with individuals, teams or contractors. Once a form is completed the data is immediatly stored, secure and available. Multiple solutions across your business - Field research, Audits, JSEA's, SWMS, Time sheets, Maintenance records etc. Our team will work with you to customise your systems. The App is branded to your organisation with the folders and forms you want. ProofSafe documentation is in plain language, the App and desktop program is simple to use. Your entire team, including Citizen Scientists, can have the ProofSafe App and forms on multiple devices ready to go with no additional charges. Additionally you can give access to sub-contractors as needed. This means your forms are familiar, tested and ready to go but you only pay for normal use by your core team, this is fair. We are offering a limited number of packages free of charge to volunteer groups - if you are a volunteer organisation focused on the environment or community, contact us to see if you are eligible. Setting up ProofSafe for your organisation may (or may not) incur a cost, depending on complexity. You will be given a clear indication of any costs prior to commencing, call us to discuss your needs. Individual using an existing account (e.g. employee joining a company) - Get your login details from your employer or project coordinator and login, you do NOT need to Register. 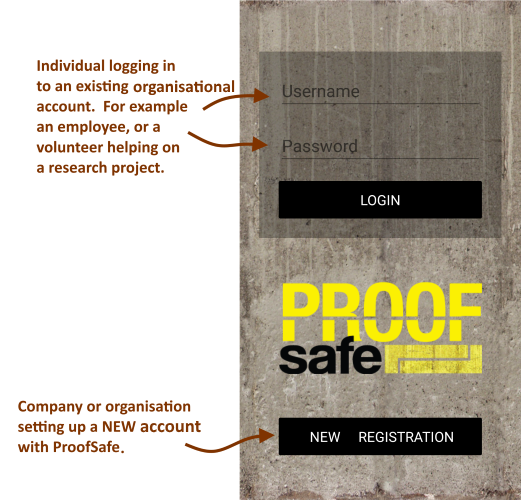 Organisation or individual setting up a new account - Using the App Store (iOS) or Play Store (Google/Android) download the ProofSafe App to your devices, then use the 'New Registration' function on your device to get started. For assistance contact us via helpdesk@proofsafe.com.au or take a look at the Help Page.